Malgré sa grande ressemblance avec son ancien confrère 1800, le modèle 2200 est un poêle qui a été conçu pour une utilisation continue et plus intensive. Le volume de sa chambre à combustion 20 % plus grand favorise le maintien d'une chaleur uniforme sur une plus longue période de temps. Cet appareil peut également être équipé d'un puissant ventilateur de 130 PCM ultra-silencieux. La surface vitrée de sa porte en saillie est également 20 % plus grande que celle de son homologue assurant ainsi une vue imprenable du feu sous tous les angles. Joindre l'utile à l'agréable, voilà une expression qui définit merveilleusement bien le poêle Osburn 2200. The stove looks great, and the wood heat is the best. I am extremely satisfied with my purchase. I love the style of the 2200 model and the view of the fire, on all sides, from the bay window. It is easy to light and the burn time is impressive, the draft inducer allows for complete burn control and I enjoy the air intake at the front of the fire, it creates beautiful dancing flames. The heat output is a tremendous improvement from my old single wall stove; the outer housing provides fantastic heat convection and air movement, this is even better with the fan attachment running. As a minor suggestion, I do wish the ash bin (love it) had rollers or rails to increase control when removing and reinserting. Overall I would make this purchase again and I will recommend your company when the opportunity arises. Thank You. 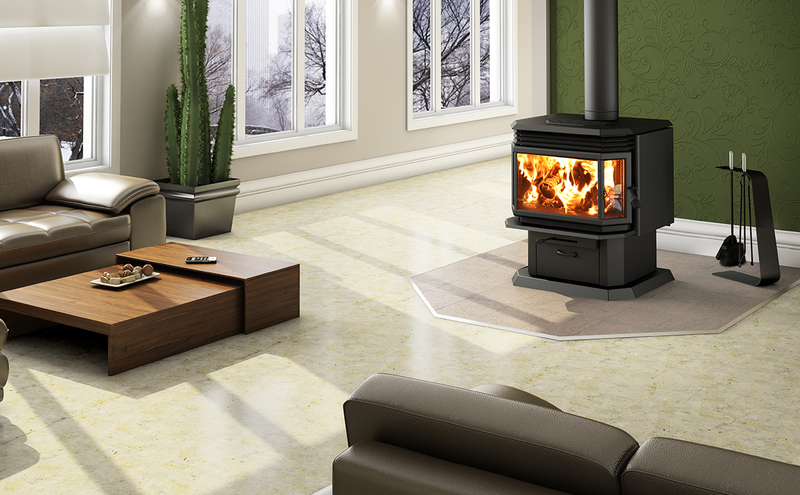 The Osburn 2200 provides great ambiance with its bay window and good sized fire box. The pedestal helps position it perfectly for viewing at our kitchen table. Hard to beat the 2200 dressed up in its gold or nickel accent. We chose nickel to match our stainless steel appliances and ceiling fan. Love it. Only complaint is the Osburn decal etched in the glass (put it on the side panel) and the red decal marking the draft control (really loud red). We saw this same model in a friends house and fell in love with it because of how beautiful it looked with the fire going. After shopping around, we found no other that compare in looks. We are very happy with it and have received lots of compliments. My install was today so I'm speaking from a short amount of time. The stove is beautiful and the purchase through eFireplace Store was perfect. Thank-you for a beautiful product.